In the three years since the release of their tightly wrought breakthrough album Silence Yourself, post-punk four-piece Savages have established themselves as one of the UK’s most vital guitar bands. Famed for their on-stage intensity, explosive sound and all-black wardrobe, they’ve amassed a global following while also pushing their artistry in new directions; striking collaborations with choreographer Fernanda Muñoz-Newsome and Japanese psych-rock icons Bo Ningen widening their repertoire. The London-based band return this month with Adore Life, a record honed during an intense "workshop" session in New York – a three-week cycle of performing, recording, analysing and repeating. Now, ahead of its hotly anticipated release, singer Jehnny Beth and guitarist Gemma Thompson tell AnOther about their quest for perfection. Jehnny Beth: "Every album is a challenge and whenever you create something there is pressure. Once you start looking at the small details one by one it becomes an obsession. When we finished touring Silence Yourself we took a break and rented a tiny rehearsal space. Only the four of us had the key and we’d be there everyday. Some days were productive and others we’d just sit and talk – which is also part of the process." 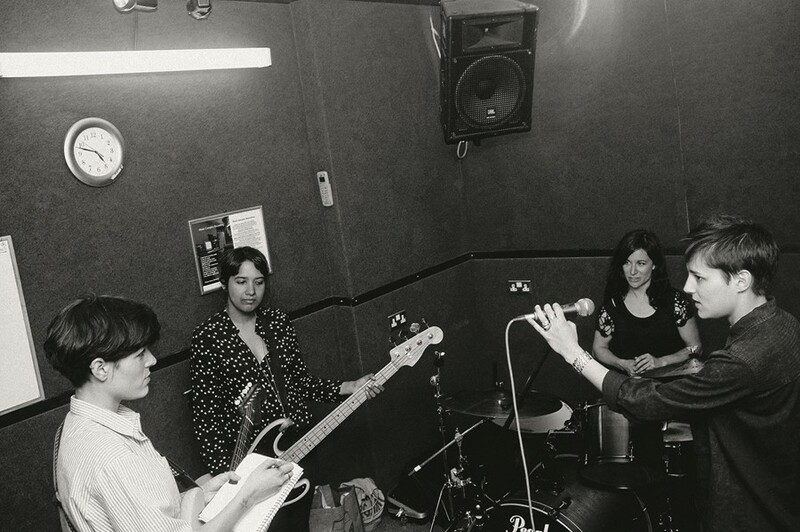 Gemma Thompson: "At the end of the last album we had a few sketches of songs but nothing we’d tried live before. The idea of going straight into the studio was alien to us as our music is so shaped by performance – I Need Something New began as a monologue and grew while we were touring." JB: "In New York we played three club shows a week, rehearsing in between and we’d record every show so we could listen back. It was a workshop in that we could experience the stage and see how that brought us and the sound together. Sometimes in a live environment you make mistakes and you get variations. I really like those accidents and find that inspiring." JB: "We like to have an intent to what we do, which can be very abstract. We might say, 'Today let’s make a really loud song, a song that never ends or a song that sounds like a bullet.' We’ll then explore that and shape what it makes us think of. It’s about making your imagination work and being inspired by each other." GT: "We learn a lot by taking Savages into new territory. Sometimes you think there is only one way of working and it’s good to realise there are alternatives. After seeing Bo Ningen at Cafe Oto our producer suggested that it’d be great to see the two bands play in the same room. We’d had a pile of books in the studio while recording and were reading the Dada manifesto, specifically about simultaneous poetry and trying to find order from chaos. So we thought we’d try to create a sonic simultaneous poem together [called Words To The Blind], which took nine months to put together. We’ve also worked with choreographer Fernanda Muñoz-Newsome and the track Dead Nature was transposed into a dance. The idea of taking one art form and pairing it with another is amazing as you can explore the many possibilities of your original creation." JB: "For us it’s the only way to perform. It’s how you choose to present your music and embracing your rapport with the audience. It makes you feel alive, it makes them feel alive and you share that moment of freedom and – sometimes – perfection together. That’s why stage is one of the best places on earth." Adore Life by Savages is out on January 22, 2016.